Image caption Official media reported that Fidel Castro, 88, appeared "full of vitality"
The former president of Cuba, Fidel Castro, has made his first appearance in 14 months. He met a delegation of Venezuelan officials on a solidarity mission to Cuba at a local school. The 88-year-old revolutionary icon was described as "full of vitality" by local press. He was last seen in public in January 2014 at the opening of a Havana cultural centre sponsored by one of his favourite Cuban artists, Alexis Leyva. This time, official media showed images of a seated Mr Castro shaking hands with the Venezuelan visitors through the window of his vehicle, wearing a baseball cap and windbreaker. Since the fall of the Soviet Union, oil-rich Venezuela has become Cuba's closest ally. 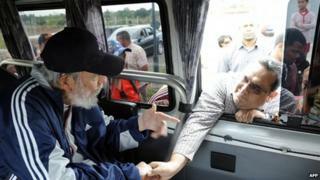 Mr Castro was a close friend of the former Venezuelan president, Hugo Chavez, who ensured Cuba received cheap oil. In return, Cuba supplied its ally with Cuban advisers, doctors and teachers. Fidel Castro provisionally stepped down due to illness in 2006, and formally announced his retirement in 2008, handing over to his younger brother Raul, 83. He occasionally writes a newspaper column and receives dignitaries at home, but rarely appears in public.